Ninety minutes before the Huskies’ first game in the Big East Women’s Basketball Tournament earlier this month, a line of fans stretched out from a meeting room just off the lobby of the XL Center in Hartford. 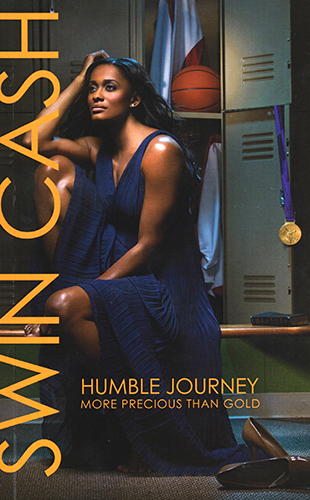 Inside the room, Swin Cash ’02 (CLAS) smiled broadly as she chatted with everyone, stood to have her photo taken when asked, and signed copies of her new book, Humble Journey: More Precious Than Gold (Empowering You Publishing). Cash also appreciates what she has been able to achieve during her lifetime so far, especially given the obstacles she had to overcome in order to return to competing at the highest level of professional basketball. Those obstacles included surviving cancer, which she reveals for the first time in the book. After experiencing back problems in 2008, caused by a herniated disk, an MRI also revealed the presence of a cancerous tumor on one of her kidneys. At the time, Cash decided not to talk about her diagnosis. Only Detroit Shock head coach Bill Laimbeer and the team trainer knew about it, even as she was being criticized for her struggles on the basketball court. She says that having worked in the media – doing basketball commentary on ESPN and NBC – she understood what was happening, but she was not yet ready to speak about her illness. Humble Journey is both a narrative of Cash’s life in recent years and an effort to describe how her Christian faith helped her to overcome the obstacles she faced both personally and professionally. While she does not write about it, Cash says publishing the book went against the advice of her business advisors. In the book, she describes how she set a goal of returning to be a member of the U.S. Olympic team in 2008 after winning a gold medal as part of the 2004 team. But with her injuries, she was not selected for the squad. Following surgery and with her back health improved, she targeted the 2012 London Games, when Huskies’ head coach Geno Auriemma would lead the team. She describes going through the selection process for the 2012 team and being called into a hotel room in Prague to meet with Auriemma and Carol Callan, Women’s National Team director for USA Basketball, to learn that she had made the team.